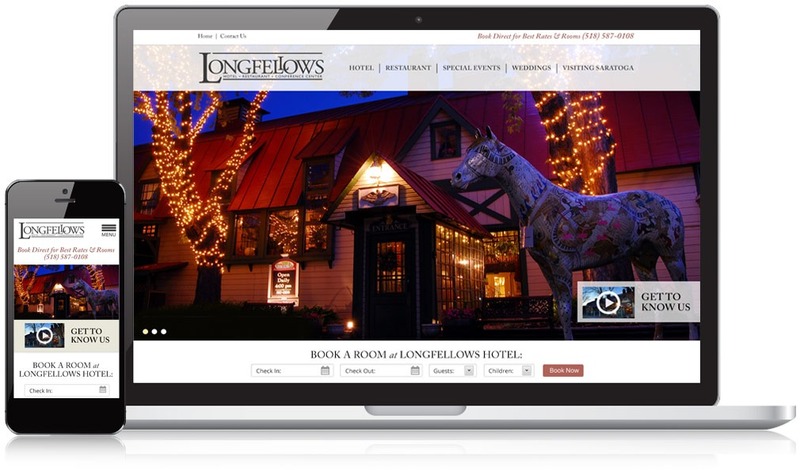 Longfellows Hotel, Restaurant & Conference Center - Mannix Marketing, Inc.
Longfellows is a stately venue in Saratoga Springs whose online presence expands beyond a simple restaurant website. This hotel, restaurant, and conference center caters to many different needs, so their site had to be organized and accommodating as well as elegant. A clear layout with easy-to-find information on the hotel, restaurant and conference space makes their website a tool that meets all demands with ease and looks great. Prospective guests can navigate through the site to quickly and easily find more information about the hotel accommodations, dining options, and conference center. As a mobile-optimized responsive website, the website is user-friendly on desktop, tablet, and smartphone devices. Site design and increased marketing resulted in a 40% increase in traffic for the following 12 months after the site launch as compared to the previous year. The responsive mobile friendly design resulted in 2x more traffic than the previous year. We have been working with Sara Mannix and her marketing team at Longfellows Hotel & the Olde Bryan Inn for over twelve years. They are the best in the business. Most marketing companies are long on promises while Mannix Marketing delivers results. From web site design and implementation to key word development and positioning – Mannix Marketing drives business to our restaurants, banquet operations, and hotel. All of our requests are handled promptly and courteously. We could not be happier with the service or results we receive from this team.